Jumping in leaf piles, catching leaves as they fall from trees, crunching leaves in our fingers, tossing leaves in the air, collecting leaves on nature walks- there are so many ways we love playing with leaves. 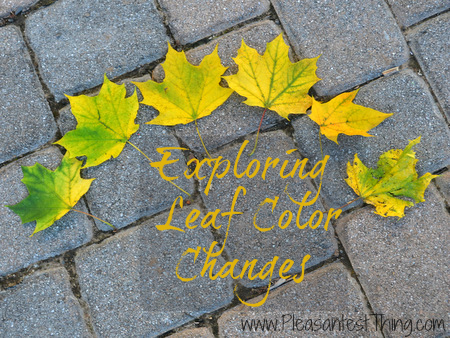 I wanted to talk do an activity with my boys to explore the reasons for the cascade of colors in the fall. What color was it when the leaves first started to form (this one was harder to recall, but he eventually remembered it was green). Then we lined up the leaves, and I explained that when the leaves first grow and all through the summer, there is something inside the leaves that colors the leaves green in the spring and summer, when the sun is hot. (He asked what it was called, so I told him that it’s chlorophyll.) Then I said the thing that makes the leaves green breaks down, and asked, “What do you think happens then?” and my older son said it makes the leaves yellow. That was pretty much all we talked about. 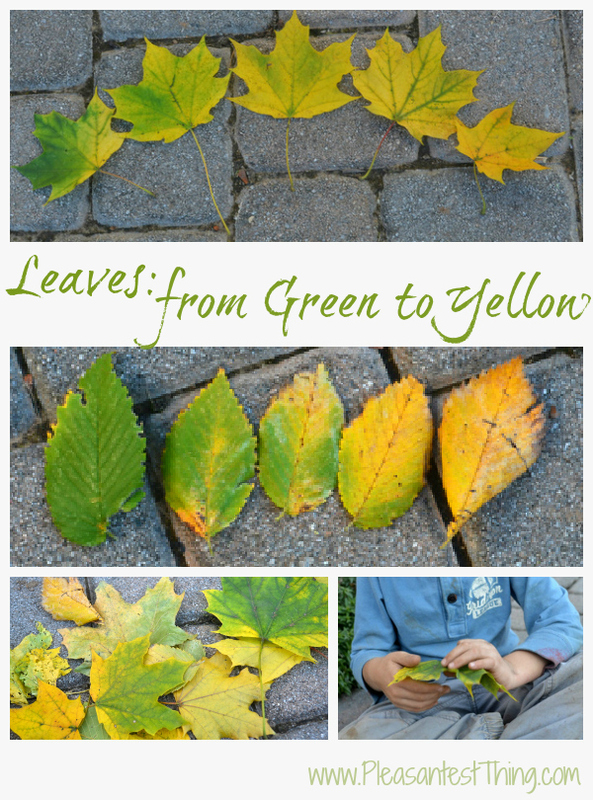 We focused more on looking at the shades of the leaves, and how the leaves gradually turned from green to yellow. We also placed several leaves in order from green to yellow. Then we just went back to our regular scheduled program of running through the leaves.